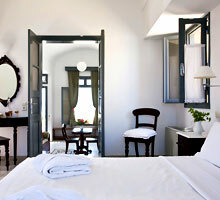 Xenones Filotera in Imerovigli Santorini was created for those seeking an exclusive experience of the Aegean ambiance. Embracing the history of the land, the Villas display a contemporary interpretation of the Cycladic tradition into stylish geometrical volumes. Face Santorini’s breeze, vivacious with fragrances of the blossoming wild thyme. Xenones Filotera will be your comfortable home for unique Santorini moments. Arriving at Xenones Filotera you will receive a warm welcome at the 24h reception. Choose one of the 18 Xenones (Villas) and enjoy breathtaking views to the Volcanic Caldera, or the immense Aegean Archipelago. Each of the Xenones Filotera, apart from Volcano Seaview Studios, can accommodate 2 to 6 persons, providing a comfortable lounge, separate bedroom, fully equipped kitchenette and private veranda. Spacious and comfortable with endless views, these villas mainly consist of a bedroom & sitting room and include a kitchenette, bathroom and veranda. 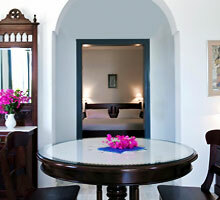 These Villas can accommodate up to 3 adults or 2 adults & 2 children. Relax and gaze the horizon while sitting comfortably on your veranda. The studio can accommodate 2 persons and consists of one main space featuring en suite kitchenette, private veranda and bathroom. The view to the Caldera is beyond words. These Villas consist of one bedroom, the sitting room with a kitchenette, bathroom & veranda & can accommodate up to 3 adults or 2 adults & 2 children. The Master Volcano Sea View Villa offers accommodation for up to 6 persons, providing everything you need for a luxurious experience. 2 bedrooms, 2 bathrooms, sitting room, kitchenette and veranda leading right into the big blue. Xenones Filotera can be found in Imerovigli on the Caldera facing the Santorini Sunset. Imerovigli is in the north of Santorini island on the way to Oia.